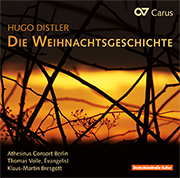 In 1934 Hugo Distler was just 26 years old when he started composing one of his most unconventional works ever, his motet "Totentanz." The 14 aphorisms for Eternity Sunday are sung by the Kammerchor Josquin des Préz conducted by Ludwig Böhme. Christian Steyer, with his striking voice, lends a particularly impressive depth to the connecting dialogs between Death and his victims. 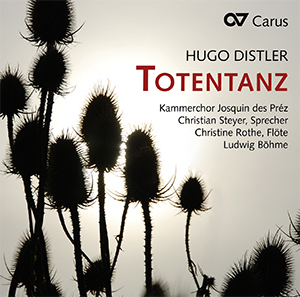 Two further motets from the "Geistliche Chormusik" collection by Distler are also to be heard on the CD which, like the "Totentanz," captivate with their innovative compositional technique which simultaneously harks back to the aesthetic of the 17th century. The choir, flutist, and speaker bring everything off handsomely, and Carus offers excellent engineering and engaging notes. There's marvellous clarity to the vocal contributions, with diction being remarkable clear. Ensemble is immaculate, as is tuning. 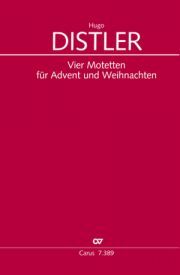 Der Kammerchor Josquin des Préz nähert sich den Gesängen unter Leitung von Ludwig Böhme behutsam und mit hoher Stimmkultur.